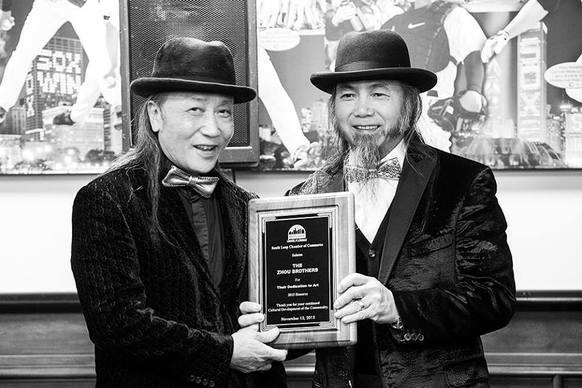 The South Loop Chamber of Commerce will be honoring The Zhou Brothers, DaHuang and Shan Zuo at their annual fundraising cocktail party this Thursday, November 12th at US Cellular Field Bards Room. Commissioner John Daley and Alderman Patrick Thompson recognize the significant cultural and economic development the Zhou Brothers have brought to the neighborhood since 1986. They were pioneers to open the Zhou B Art Center in an abandoned Spiegel Catalogue Warehouse Building in 2004. Since then the center has developed into a premier art destination, hosts 60 resident artists and has held hundreds of exhibitions displaying thousands of pieces of art. October 16, 2015 Mayor Emmanuel led a group of dignitaries to dedicate Honorary Zhou Brothers Way. Last year former Governor Patrick Quinn dedicated October 16th as Zhou Brothers Day in Illinois. This year the 11th Anniversary of the center celebrated with the City of Big Dreams Fest with a variety of performances from ballet and hip hop to jazz and spoken word. The Zhou Brothers will be featured in WGN Chicago’s Very Own in December. WTTW will air their documentary on vital neighborhoods on Chicago’s South Side, highlighting the Zhou Brothers. Their new exhibition “Water Lily Pond of Life” is on display at the Zhou B Art Center.